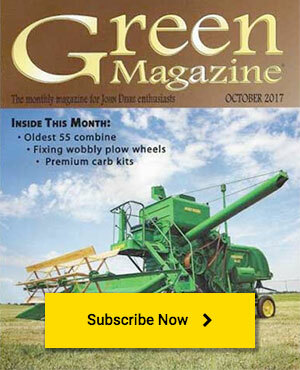 At one time or another, most of us will end up dealing with the chore of removing a rear tire and hub from a John Deere splined axle. If you are like most of us, this little experience will stress your religion, test your patience and endurance. After you have dealt with John Deere’s rack and pinion axles but then go back to work with a splined axle, you can appreciate the advancement in engineering with the rack and pinion axles. Don’t get me wrong here—the rack and pinion axle set-up can also give you quite an experience if they have never been moved in the past 30 years or so. Actually, the splined axle set-up John Deere used on its lettered series tractors really wasn’t a bad design. The splined axle and hub set-up worked very well, and to my knowledge, I don’t know of any stock horsepower tractor that ever sheared the splines off or stripped out a splined hub. When the splines are clean and free of rust, that set-up actually is not too bad to deal with. The original intention of the engineers was more than likely to build a trouble-free design that an owner could deal with using simple hand tools. If a farmer plowed with his tractor in the spring, he would move the wheels in so the furrow tire would track in the furrow. Then, when it was planting time for row crops, he would move the tires out for the proper row spacing. If the tractor ended up with a mounted picker in the fall, the wheels would more than likely be moved again to accommodate the picker. As long as the farmer moved the wheels in and out each year, it wasn’t really a big issue to loosen and move the wheels. 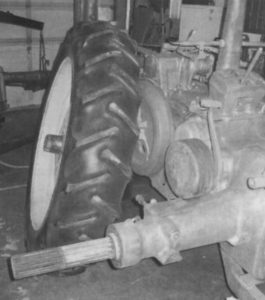 Unfortunately for us collectors/hobbyists, many tractors had their wheel width set when the tractor was fairly new, then it was never re-set again, enduring several decades of rain, chemicals, manure acid, etc. Then we wonder why they are such a treat to deal with today. There is a way to deal with splined hubs and axles that will take a lot of the sweat and stress out of the process. To move, or totally remove, a rear wheel from a splined axle, a few simple tools can be fabricated to make the job actually easy. 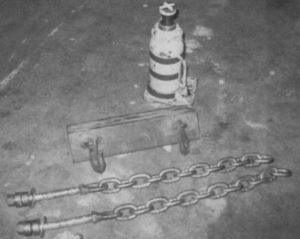 Two lengths of one-half inch proof chain about 18 inches long, welded to the head of two one-half inch grade 8 bolts about six inches long, a piece of angle iron four by eight by one-half inch thick and 14 to 16 includes long with two chain hooks welded to the angle iron and a 12 ton hydraulic jack will make your life much easier. Refer to the photos to see how the pieces are put together. After removing the clamp ring from the hub (remove the three clamp ring bolts, thread two of the bolts into the threaded holes of the clamp ring, alternately thread the bolts in until they push the clamp ring loose from the hub), insert the two bolts with the chain welded to the head, through the hub from outer end of the hub. 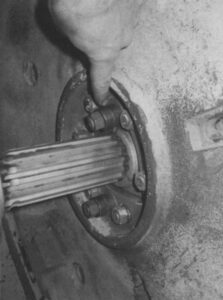 On the inside of the hub, place one or two flat washers over the puller bolts, up against the inside of the hub. Thread a nut on each bolt—hand tight is plenty tight. Next, hook the chains to the hooks that you have welded onto the heavy angle iron. 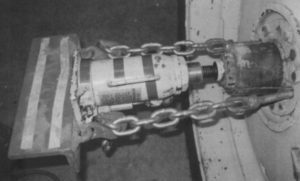 The reason for having the chain is to accommodate hubs that are spaced in or out farther on the axle. Place your hydraulic jack between the end of the axle and the angle iron with the jack ram against the outer end of the axle. Most hydraulic jacks will not work unless the pumping piston is on the bottom side when the jack is put in place. Again, refer to the photos. As long as you did a good job welding the chains to the bolts and the hooks onto the angle iron, you can use the full capacity of the jack to move/remove the hub. It may be necessary to strike the outside of the angle iron with a five pound or 10 pound hammer while you have hydraulic pressure pushing against the axle. In the majority of the cases, this will get the hub to move. Notice we said that in the majority of cases, this will work. Well, nothing is ever foolproof in this hobby of ours. On occasion, you may have to remove the cast center or steel rim from the hub, then heat the hub. Continue to use heat on the hub, with pressure from the hydraulic jack, and strike the angle iron until the hub moves. Once the hub makes the first initial movement, the rest is a piece of cake as the saying goes. On very rusty splines, it will be easiest to use the hydraulic jack to remove the hub all the way until only one to two inches of the hub is still on the axle. Remember, cast centers are very heavy and tires with fluid in them are very heavy, so please have a helper and use caution. You may need to reposition the chains to a chain link closer to the pulling bolts as the hub is being pulled off. Once the hub is removed from the axle, you should use a wire wheel on a drill or similar method to remove the rust from the axle. Removing the rust from inside the hub is done quite easily with a sand or media blaster. Once the axle is free of rust, prime paint it with a light coat of primer, then a coat of John Deere Blitz Black, which is not a gloss black, nor is it a flat black—it is something in between. Now is the time to sandblast the hub, clamp ring, rim, cast center or steel rim or spokes and prime paint them. Finish paint these parts and allow them to drive at least 24 hours. On some tractors, I also sandblast, prime and paint the huts and bolt heads. On other tractors, I install new cadmium plated nuts and bolts. Installing new cadmium plated nuts and bolts is not “original,” but adds a level of detail to your restoration that looks attractive. When you re-install the hub, I like to put a light coat of Never-Seize inside the hub before re-installing. The next time you or someone else needs to adjust the hub in or out, it will be a simple task. As the hub is re-installed, some of the paint on the axle will get scratched, but this isn’t the end of the world. Just use a small model builder’s paintbrush to touch up the paint that is scratched off when the hub is slid on. You may choose to paint the nuts and bolt heads because they, too, will end up with the paint getting marred or chipped when you tighten them. Again, use a small model builder’s paintbrush to touch up the nuts and bolt heads. I hope this makes your next wheel/hub moving project much easier or gives you the courage to tackle that one that you have been avoiding. In case some are wondering if you can crack or break the hub using hydraulic pressure, I haven’t broken one yet. This has worked on 12 hubs without incident, although that’s not to say it couldn’t happen. Nothing in this life is for sure; I guess I should clarify that—death and taxes are a sure thing. Again, enjoy this great hobby of ours!